Patricia Thompson, a longtime member of North Philly’s Bright Hope Baptist Church, has attended A Soulful Christmas at the Kimmel Center every year since its inception in 2012, but the production on Tuesday night was particularly special for her. Thompson, sitting beside her husband of 52 years, John, was most excited to see her daughter sing in their family church’s choir. She made it clear that she’d dressed appropriately for a night of “good singing and praising God.” J. Donald Dumpson, the evening’s artistic and musical director, had introduced Thompson to Bright Hope more than 30 years before. “I got on my shoutin' shoes,” Thompson said, pointing to a sensible yet stylish pair of black ballet flats. 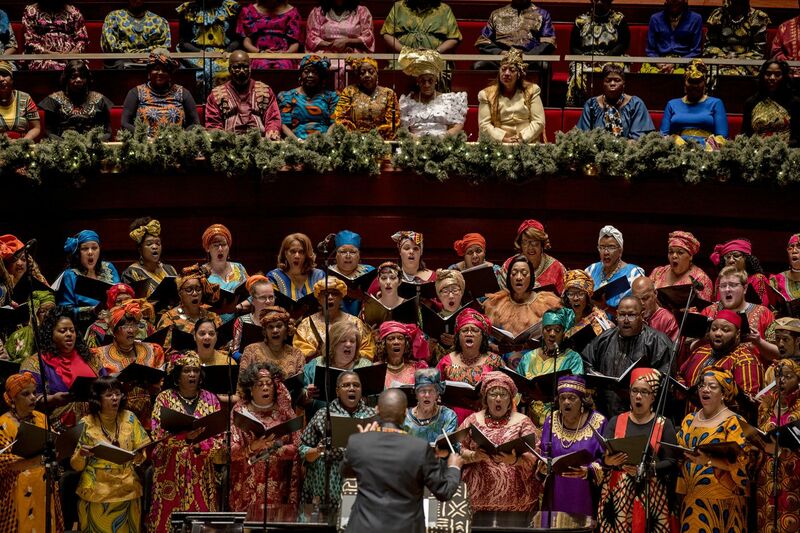 For the last five years, the Kimmel Center has produced the annual musical celebration that features holiday and contemporary selections from some 600 gospel choir members spanning eight regional choirs. Dumpson presented this year’s lifetime achievement award to gospel powerhouse Dottie Peoples. In front of a sold-out crowd, leaders from each church set the stage for their choirs by offering a mini-sermon on the foundational principles of Christmas. For the first time, WDAS will broadcast the show on Christmas Eve. Leslie Patterson-Tyler, director of media relations and communications at the Kimmel Center and first lady of Mother Bethel A.M.E., said she had never seen the show sell out so fast. Olivia Turner of Germantown’s Cannon Baptist Church, who’d been invited by a fellow church member, described the evening as a “Christmas revival." Her love of gospel music keeps her coming back year after year. Parishioners were dressed in their Sunday best … on a Tuesday. Many women used fur and elaborately designed hats to add a touch of luxury to their garments, and several men were dressed to the nines in colorful suits complete with cuff links and matching shoes. Outside the Kimmel, droves of school buses and church vans were parked along Broad Street. Jacqueline Spraggins solos with the Enon Tabernacle Baptist Church Mass Choir. “It was so cool listening to [people in] the crowd saying, ‘Good to see you.' This feels like a reunion," said Anne Gemmell of South Philadelphia, a first-time attendee along with her husband, WXPN general manager Roger LaMay. They said they would give tickets to A Soulful Christmas to their relatives next year. Several choirs and speakers took the stage to robust cheers. But Peoples commanded attention in a long-sleeve, mermaid-hemed holiday-red gown embellished with clear gems at the collar and wrists. After being presented with the lifetime achievement award, Peoples tore into two of her most popular hits, “Testify” and “On Time God." “I can do whatever I want?" Peoples asked, suggesting she wanted to (and likely would) deviate from the program if the spirit moved her to. True to her tradition of strong showmanship, Peoples kicked off her high heels and led the audience in an old-fashioned praise break, punctuated with a call-and-response chant. She mastered the delicate balance of preaching and singing, and demanded audience members get out of their seats and dance along to the infectious sounds of Southern black gospel. NAACP Image Award-winning singer and Grammy nominee Dottie Peoples performs onstage at the annual A Soulful Christmas communal gathering of regional choristers at The Kimmel Center's Verizon Hall December 11, 2018. The spiritual energy of the room was undeniable. People were raising their hands in high praise or clapping to the tempo of the praise break. “I love the atmosphere," said Diane Lewis, who was there with her daughter and niece. “It’s just so positive and uplifting and encouraging." “There were people in corners going over their music. You had people talking, eating, and laughing it up. There were nerves, but the nerves were controlled and focused on the project at hand," Hicks said. According to Hicks, the night’s most magical moment was when Peoples sang “Silent Night” as audience members waved illuminated blue lights.